The Legacy Foodservice conference in Richmond last month was a great event and we are thankful for the opportunity to attend and spend time with our industry friends. The Legacy team put on a fabulous show in their hometown and the members came prepared to do business. AFS had the opportunity to meet with distributors of all sizes to discuss their pains and opportunities. The challenges I heard from members were consistent; driving down costs and finding better ways to serve customers and employees. Many of you were looking at technology to help. Other items of deep importance discussed at the show revolved around traceability, integrated deal tracking, proof of delivery, e-logs, suggested purchasing, operations (either to optimize warehouse space or drive efficiency), sales order management, margin management and analytics. All areas we at AFS can help you with and we are just a phone call or email away. With it being harder than ever to attract a quality workforce in our industry, tools that AFS provide make it easier to attract new professionals to your organization or retain employees, cutting down on costly turnover. One final thought, the subject of FSMA to your operation and how you can use technology to better collect important data for reporting and documentation, as well as to market the safe supply chain you bring to your customers. A number of you had a strong interest in adding a quality WMS to your company that would help you meet the regulatory needs of today, and the future, as well as putting your good tribal knowledge in to workflows and processes that help you elevate the productivity of everyone in the warehouse. 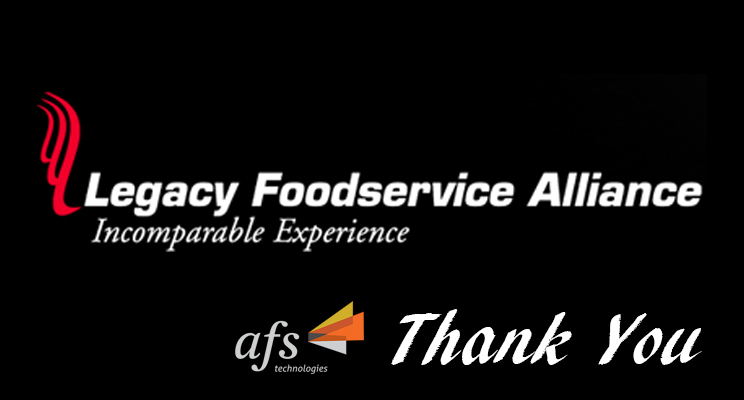 As your purpose–built technology partner, AFS Technologies is ready to serve you. As we talked about at the conference with many of you, AFS believes you should invest in technology when the time is right and the ROI is defined. Please let me know when I can help you explore both. Tom Dominic of Giardoni Foods, Deer Park NY. Congratulations to Tom and thank you all for sharing information about your company with us. We look forward to speaking with you in the near future. Please reach out to AFS should you want to talk to our team.